Session Packages expire on the last day of the session for which they were purchased. Monthly Memberships begin on date of purchase and expire 30 days from the date of purchase. Session Packages and Monthly Memberships are non-transferable (i.e. another person may not attend class in your place). We require a minimum commitment of 3 months for a client to enroll in monthly auto-pay. After the first 3 months, the client can cancel auto-pay by providing us with written notice 30 days prior to the date of the next auto-pay deduction. No exceptions. 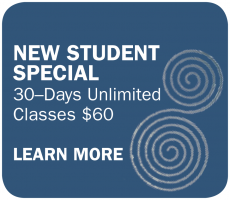 We offer a 10% discount on FULL session enrollment and 10-class packages for clients ages 60+ , active military and college students. Military and college students may be asked to show an ID. Discounts cannot be combined and do not apply to monthly memberships, prorated enrollment, promotional offers, or drop-in rates. Missed classes can be made up at any time during the session in which they were purchased at the same level or lower. You may also make up a class in advance of an anticipated absence. Classes are non-transferable. Workshops and classes for children are not included. Requests for dropping a class, transferring, and for refunds will only include classes remaining in the session from the date of the request and will be addressed on a case by case basis. No exceptions. No full refunds. A $25.00 administrative fee is required to process a refund. Refunds for purchases made by credit cards may be issued as a company check. If a workshop is cancelled by Rolling Brook Yoga, registered participants may be issued a full refund or a credit that can be applied towards other workshops or classes. Otherwise, workshops are non-refundable. A minimum non-refundable deposit of 50% is required to schedule private instruction. The balance will be collected when the client(s) arrive for the private event. Please contact us for pricing and scheduling. Private instruction that is cancelled by a client up to 24 hours prior to the scheduled time may be rescheduled at no additional cost. If a client cancels private instruction within 24 hours before the scheduled time OR fails to show up for a scheduled session, the client will be charged in full and the session will not be rescheduled. There is no advance registration for ‘drop-ins’ and space is on a first-come, first-served basis. Enrolled students have priority in the class. Gift certificates are valid for 60 months from the date of purchase. Gift certificates are non-refundable. We require a minimum age of 16 to attend classes unless otherwise specified. We offer classes and workshops several times a year for children under 16. A parent or legal guardian must complete a waiver for all minors who wish to attend classes at Rolling Brook Yoga. Rolling Brook Yoga does not provide child care. In addition, children may not be left unattended. If you have any physical or medical conditions, including pregnancy, please inform your instructor at the first class. In addition, please consult your physician before starting any new exercise program.